Home > smugmug	> SmugBunker on LifeHacker! Vote! At SmugMug, we give every employee a healthy office decoration budget – and we only hire expressive people. So we’ve got a Tiki shack, and some sort of a treefort, and all sorts of other stuff going on. 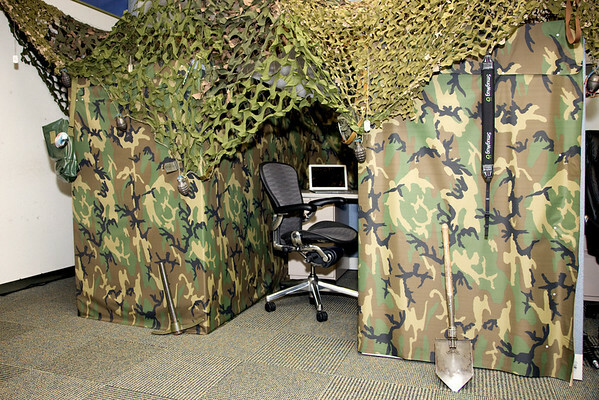 Two of our employees decided to create the SmugBunker (above) complete with grenades and cammo netting – and it’s up for an award from LifeHacker! We need your help though – go vote for ‘Cubes of War’ (aka the SmugBunker) is the best! Vote! iPhone, SDK, SmugMug Tripit totally rocks.